There is not much fun in collecting if there is nothing to collect. So most collectors choose a collecting field where material is available and at prices they can afford. If you like browsing dealer boxes at collector fairs but don’t want to spend any money, all you need to do is pick a field of interest where you will never find anything. Letters from Russian Alaska to Russia would be a good idea. Collectors don’t try to converge on the same interests, but many do, and a side effect is that some things which could be collected never are or only by two people, one in Iceland and one in New Zealand. These are then the neglected collecting fields. When I try to think of things which are neglected, some are quite general, others specific to my own broad areas of interest. At a general level, the neglect of large format items is really quite extraordinary. It is explained by not much more than the reluctance of most collectors to spend money on the necessary albums or holders, things which would hold complete sheets, fiscal documents or very large envelopes. But, for example, large envelopes are the most likely location of high frankings, multiple frankings, and so on. They should be sought after for that! 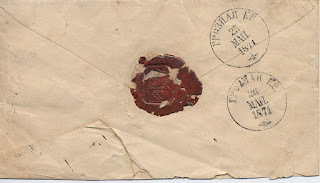 In relation to my own areas of interest, it always surprises me that more attention is not paid to local and postmaster perforations. These are not always rare – for Estonia in the period 1918 – 1920 they are quite common. And they are perhaps more common than is realised because quite often they are to be found, unnoticed, in stockbooks of loose stamps. This is true for late Russian Imperial stamps issued imperforate but perforated in 1917 -1918 by postmasters and private commercial firms. 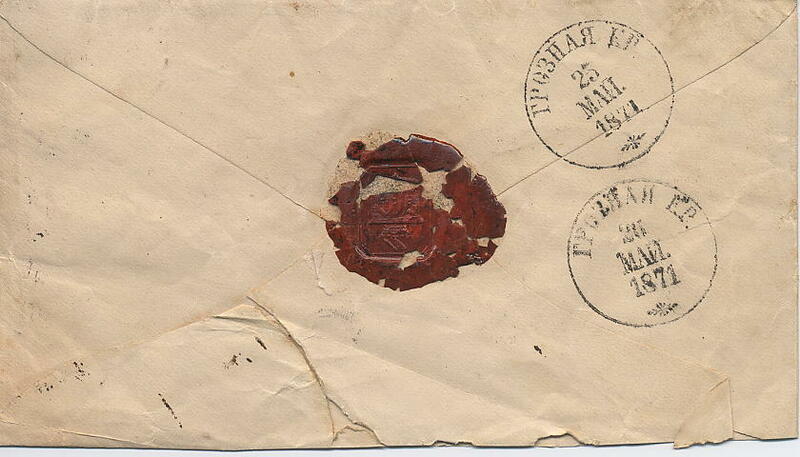 I have even found postmaster perforations unnoticed in accumulations of other Civil War period stamps like the Denikin issues of South Russia. The same is true for other countries: I found local perforations recently unnoticed in an old stock of Colombia. Collectors generally pay premiums for multiple frankings and four-colour frankings, but in some times and places it is the single frankings at the correct tariff which are scarce. This is especially true in periods of inflation when the face value of stamp issues does not keep pace with the increase in postal tariffs. But no one wants to pay a premium for a single franking. In France and Germany, it is common to collect your home town or some other place with which you are associated. But it seems less common in Russia and the old eastern Europe to make Heimat collections. It is even less common for a collector in another country to pick a small city or a large town in another country as the field for a collection. But an interest in history ought to lead more collectors than it does to places which have always been in the news: fought over, occupied, devastated by famine or earthquake. Some of the larger cities do get attention but the smaller ones much less so. 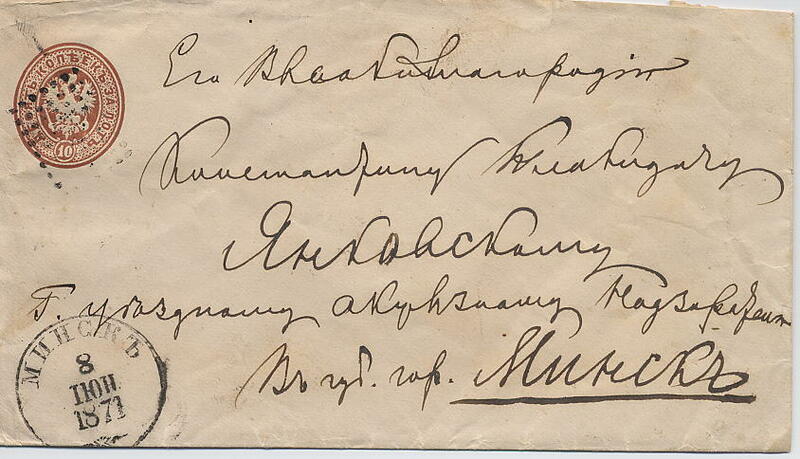 But the stamps and postal history of places like Archangel, Berdichev, Dnepropetrovsk, Ekaterinburg, Fergana, Grozny…. 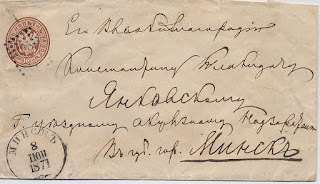 right through the alphabet… well, there are fascinating histories everywhere. And material exists: in the case of Grozny, for example, the activities of the Nobel Brothers leave a trace in dealer boxes. [And see now the cover below]. 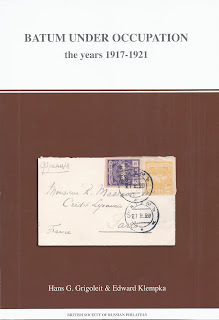 Howard Weinert contributes this splendid cover from Grozny to Minsk. Click on the images to magnify.